We said “yes”…and they came. The social worker arrived first followed shortly by Sadie and Abel with their grandparents, and aunt. The social worker, Dawn, explained the logistics of what this placement looked like. We were not licensed foster parents yet. We had only completed classes but not gone through the rest of the licensing process. Because we knew their family, they could stay with us as a kinship placement. Normally that is reserved for family members, but it can also be used by friends or acquaintances who take children in. When you foster children, there are requirements about how many kids can be in a room, the ages and genders of kids that can share a room and endless number of other requirement. At the time, four of our kids slept in one bedroom. Elliott (the baby) slept in our room and the only other room was used as a playroom. It did not meet the requirements for foster care. It had an unfinished bathroom, with no door and exposed wiring (don’t worry…it was on the ceiling). It was halfway done but definitely unfinished. Now, with kinship care, the rules aren’t quite as strict as regular foster care, but we did not have any way to arrange the bedrooms at that time to accommodate the gender requirements. Sadie had spent a great deal of time off and on with our neighbors through the years. They were her second family, and she loved them dearly. In the end, they agreed to have Sadie come live with them, and Abel would stay with us. The courts agreed to “separate” these two kids only because they would live next door to each other. Normally, the courts prefer to keep siblings together. When they came, Abel was almost 1 and Sadie was 7. He lived with us and she lived next door. This would begin several very difficult years for me personally and for our family. It was a time of intense spiritual warfare, emotional turmoil and physical fatigue. At the time, I was severely sleep deprived with a newborn baby, and now the work doubled with Abel, as he was still really a baby himself. We had 4 kids in diapers. There were 6 kids in the house ages 8 and under..5 boys and 1 girl. Mike worked nights and I needed to keep the house quiet during the day. Yeah Right! I tried…I really did, but with hard wood floors and kids home all day because we homeschool, our house was NOISY…so he was almost always sleep deprived too. Abel had a difficult time adjusting. He would scream about everything.He couldn’t talk and the poor little guy’s world had been turned upside down. There is something about a high pitched scream that puts your whole body on edge…so we constantly felt worn…from the screaming, from the lack of sleep..from life. Then the fun began. Normal toddler behaviors like taking off clothes, progressed into picking apart diapers, smearing it all over and yes…eating it. It was a nightmare. I suppose some of this is “normal” too but nothing felt that way–it all felt like extreme stress. Every day.This went on for months…sometimes more than once a day. It was its own form of torture, because we didn’t know how to make it stop. Finally, with the full knowledge of Children’s Services…we used tape. Yes, we taped his clothes on. I remember nervously laughing as I told the social worker what we had resorted to. I pulled out my camera to show her the little boy with his hair and face caked in poo and told her we were desperate. She said…keep doing it! So between that and putting him in jammies backwards, we had our new wardrobe. All his clothes from that age had adhesive residue on them. It didn’t wash off. A permanent reminder that we were living some kind of crazy new existence. For the first 6 months or so, we just did our own family thing. Normally, kids in foster care have visits with parents, but their mom was in jail and there was no dad in the picture, so no visits occurred. It took months for his grandparents to finally be approved to take him for the day. They were the ones who had cared for Sadie for years…but suddenly, they needed background checks and fingerprints to spend time with their grandkids. So odd…but that is the system. In the new year, their mom was released from jail, so we began a regular visitation schedule. We lived quite a ways from Children’s Services, so a driver would come and pick up the kids and take them to a visit and then bring them back. It was a 40 minute drive each way and the visit would last 2 hours. This happened every week. One of the things we started to observe with him and later Sadie (once she moved in) that we have seen in other foster kids is the cycle of behavior brought on by family visits. One of the kid’s counselors compared it to the dynamic of divorced families. Each “home” had different rules and expectations and the kids were lost in the middle. As such, you start to see behaviors that cycle with the visits. At our house, we rarely had sweet drinks and used portion control. Visits with mom meant excessive food and drinks (so that every time, he would completely wet out his outfit). He would often return in new clothes, with expensive shoes or with new fun toys. We normally wear hand me downs or shop at the thrift shop. New clothes and toys every week are unheard of for us. It felt surreal. Following the visits, his behavior would be more hyper or agitated and would often last for a day or more before settling down some. Visits with grandparents would have their own pattern of behavior. At the time, I was struggling with a lot of anger. I knew I had agreed to this situation but our entire lives had been upended. I was tired, frustrated and lonely. Somehow his mom buying all these new fancy things just aggravated me more. I felt like a babysitter with my life being dictated by social workers, visits, paperwork and Children’s Services. Unlike a babysitter, it was 24/7 work. I was watching her child and she got to go home and watch TV or read a book…alone…in quiet. Two things I had none of at that time. After about 9 months, our house had been adequately modified, and Sadie came to live with us too only days after we finally completed our foster care license. When kids come into care in Ohio, the parents have 22 months to get their act together and work their case plan before the courts will award permanent custody to Children’s Services. At the point Sadie came to live with us, we were almost halfway there. While life with Abel had been challenging, I soon realized it was nothing compared to dealing with an older child in trauma. Trauma…that is a funny word. I used to think it meant getting physically hurt. If you fall out of a tree, you might get head “trauma.” It turns out, this is one loaded word that you may never deal with if you life doesn’t intersect with people in crisis. Trauma is anything that overwhelms one’s natural ability to cope. So, foster kids…they are usually the definition of trauma. Of course, we were new to this whole fostering thing and WE HAD NO IDEA. So, life with Sadie looked like a hurting little girl trying to wrap her mind around her family falling apart. Not only was she separated from her biological family, she had moved to our house from the neighbors whom she considered her second family. Of course, kids don’t tell you they are hurting. It comes out as defiance, anger, control, isolating, hurting others, threats, stealing or any number of other behaviors…some of which we struggled with in our home. It can look like all manner of behavioral diagnosis and often these kids are medicated to “treat” their behavior. The problem is…those are band aids and trauma can be masked but if it’s not dealt with, it buries itself and comes out in unexpected ways. Life at our house during that year ranged from calm to all out war. If she was defiant, I would match it. If she didn’t listen, I would have the last say. It was ugly…my reactions were not pretty. People would assure me their children were defiant at that age and inside I would feel defeated. Sometimes family or friends would see the behavior in action, and when they did, they knew what kind of struggle we were really having. We tried counseling. We tried homeschooling; Children’s Services approved her to do an online charter school at home as a foster child which is virtually unheard of. We tried cutting back on visits with grandparents. We tried more time with grandparents. We tried diet changes. Honestly, we were grasping at straws. Some of those things helped, but we would always spiral back into a negative pattern. We had no idea what to do to really help this child. It was during that time that I started to say…”I hate parenting books.” I read a lot…it’s how I learn and process, but It turns out, advice that works for “normal” kids doesn’t usually work for kids with trauma. Things are all twisted up in their brains. So, things that worked for my other kids didn’t work with her. It was like trying to speak another language without a translator. There were so many times during that year that I said I wanted to quit. I could not go on. Even then, I definitely cared about her…I just had no idea how to help and it felt like we would be stuck in this limbo forever. Meanwhile, Abel had turned into a smart, really cute, little boy who was hyper, hyper, hyper. He was fast, smart and very curious. After he learned to walk, we had to keep a constant eye on him. He would disappear if you turned your back on him. He let himself out of the house in the middle of the night and my mom found him at 4:00 in the morning. My parents live next door and my mom was awoken by what sounded like a child’s cry. She bolted out of bed and outside looking for the source. When she walked behind our house, she found Abel crying as he walked back from the neighbors horses. On top of that, he was super fast and sneaky so I was always afraid he would make it to the road or get into something dangerous. We bolted our doors. We locked every cabinet. We gated our living room to try to keep him safe. It all worked..he lived! But we did feel like crazy people. When people would come to our house, they were immediately drawn to Abel. He is adorable. But, they didn’t see the constant behaviors that we were trying to manage with our choice of structure. I felt undermined when people would not do what we asked, because he was the kid that required contant repetition and creating “exceptions” was like a reset button for him. I tried to explain it but when you are in the middle of it, you doubt yourself most of the time. So I never really knew if I was doing the right thing. They all look thrilled to be here…but really its the only picture I have where my little boys aren’t climbing on the table or the judge. So you know…it’s what we’ll go with! Eventually, their birth mother decided to sign her rights over and Sadie and Abel became available for adoption. Abel had lived with us for 2 1/2 years at that point and Sadie just under 2 years. We knew we wanted to adopt them.. They were part of our crazy life and we loved them. But there was part of us that really struggled. We didn’t feel like a family. We didn’t feel connected the way we wanted or hoped. We felt like a puzzle missing edge pieces to hold us together. Even so, we agreed to adopt them. At this point, it may sound like we shouldn’t have adopted, because life was not rosy. Thankfully, right before their mom signed over her rights, I had a realization. I felt like one reason we were really struggling was due to our car situation. Since Abel and then Sadie came to live with us, we had not had a vehicle large enough for our whole family. We had a mini van that sat 7 people. It was paid for. With Sadie and Abel in our home, we were a family of 9. So, for over 2 years, we didn’t do fun stuff as a family without driving two vehicles or carpooling with extended family other than our short stint as shortbus owners. We were divided. We didn’t go on vacation. Every time we left the house, we had to plan how we would transport. There was no spontaneity. We strongly oppose taking on debt, but we didn’t have money to buy a vehicle outright. There are very few used 12 , passenger vans on the market that don’t have a lot of miles, so we knew it would have to be newer…and therefore, be expensive. We had to make a choice. Was it worth it to take a loan to keep us sane or should we maintain our plan of debt repayment to work toward being debt free. We had recently paid off another loan, so we now had a little margin in our budget. So, almost on a whim (a desperate whim), Mike and I headed to the dealer and bought a van one Sunday afternoon. This was a decision made in less than 24 hours. Praise the Lord for spontaneity. Over the next 10 months as our case moved toward adoption, our story definitely had its twists and turns. For Abel, the transition toward adoption was seemless. We were the only mom and dad he really knew. Despite having visits, he had accepted us as his parents. But for Sadie, she struggled with divided loyalties, inner turmoil and a lot of anger. Thankfully, we did end up finding a great counselor to help us navigate these challenging waters. Also, once we had a van for our family, those little (BIG) things became a part of our routine. We took the kids to museums and parks and ice cream. Their small insignificance had been masked by our difficulty to do them for so long. We took them out west to South Dakota to visit Mike’s parents. It had been 3 years since we went on a vacation. When school started in the fall, Sadie and Abel were not yet adopted. But, we signed the intent-to-adopt papers, so they did allow her to homeschool. We were starting to mesh as a messy family unit. It wasn’t perfect. It wasn’t pretty sometimes…but it was us. One of the interesting parts of planning to adopt is the choosing of name. With older kids, the courts discourage radical name changes…especially the first name. Several of my other kids have family names in them as middle names, but as it turned out…Sadie and Abel already had our names in them. “Sadie” is a name derived from “Sarah.” Both mean Hebrew princess. She and I are very much alike…strong willed, defiant and loyal. One of her middle names is Elizabeth, which is also the name of my mother, sister and great grandmother. One of Abel’s middle names is Michael which is my husband’s name. We didn’t pick those. They were already there and I don’t believe in coincidences. To us, it was just one more confirmation of the Lord working in our lives. 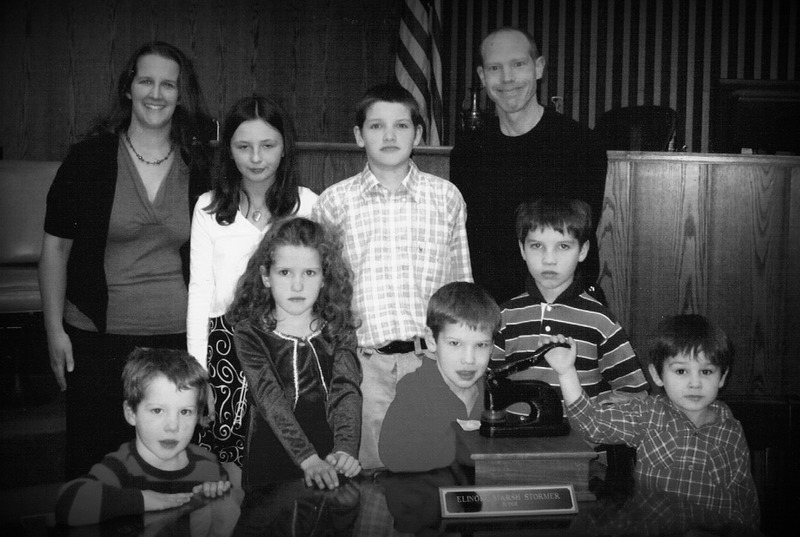 In December 2013, we walked into the courtroom and adopted them into our family. But really, their family adopted ours too. We have been so blessed by their grandparents and aunt who stay an active part in their lives and who bless us with their friendship. Both of our families…our parents, siblings and inlaws, have been such a huge blessing to us. They walked alongside us as we were struggling…falling apart sometimes. The heard us speak the ugly and I’m sure they prayed us through. We could not have done it without them. Adoption doesn’t end with the court date. It is its own kind of new beginning. 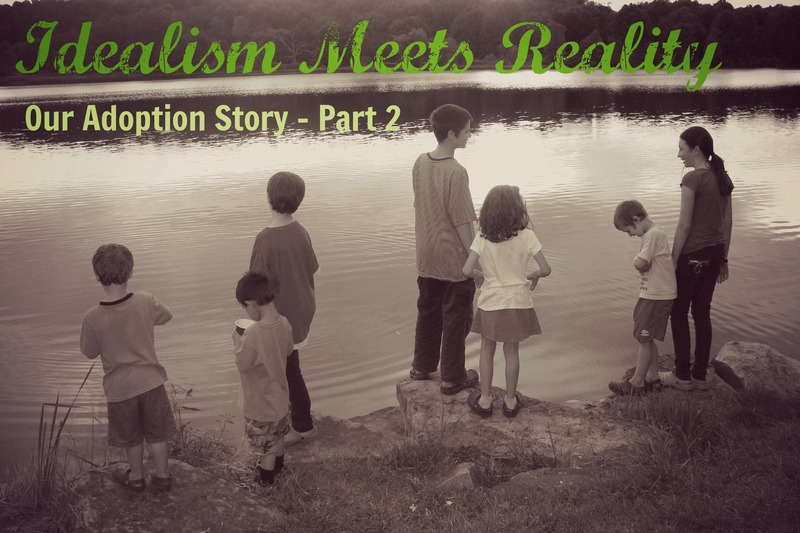 In the next week or so, I will add a part 3 where I share what we have learned since finalizing our adoption.